For the sake of Valentine's Day, I offer one of the most profound quotes I've ever heard from a wise man. "Look" he says. "The most important job for a man is to find the right woman. It's the best we can do..our job is to pick a caring, smart, mindful woman." Like I said...profound..right?! Alright..enough of sentimental Yi...back to IronYi! This week's workouts consisted of a great run along the Golden Gate Bridge...getting launched from my bike trainer...awesome! Read on..
Training this week went really well especially considering I ate 3/4 of a big bag of dark chocolate peanut M&Ms! I did! I went to M2 spin on Tuesday and pushed out some milestone wattages! M2 would be proud if he had been awake to pay attention :). Although, he probably wouldn't be happy until I pushed it up to the 300s which I don't really foresee it happening anytime soon...or ever...well maybe for like 2 seconds! Wednesday AM, I met Hez at the track! It was 6am and we were standing around wondering why the track was closed...we b*tched about how they need to post signs and stuff if the track was going to be closed. Sure enough after minutes of complaining...we noticed the little letter size sign about pesticides and track closure for the day so we drove over to the park and did our little run there instead! Started our dark but finished with a pink sunrise! 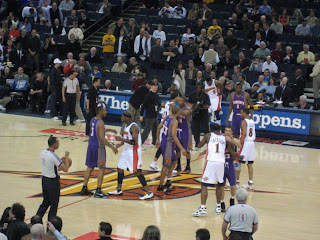 Wednesday night came around and I had tickets to the Suns and Warriors game!! I've been talking about going to a Suns game for ages!! Finally!! Danny (best bud from high school) and I were stoked to get our hands on some sideline club seats! Sideline club...we get our own concession area...own bar area..not that I drink but it was a nice to know! I said to Danny, "Now the only other seats I'd be willing to sit at would be court side!" It was a great game...,down to the wire. Suns lost by 2 but it was great to be able to see Nash, STAT, Diaw, Raja, Shaq, Van Gundy's bald head, Coach D'Antoni and even spotted Dan Marjile! Oh..saw the Warriors players too...Jackson.. Croshere..Harrington..Davis..Monte..Matt Barnes..Chris Webber not suited up. It was great! Suns lost this game but they whipped on the Mavs the next day! That would be the best Valentine's date or any date ever..a great Suns home game! Take note guys :)! 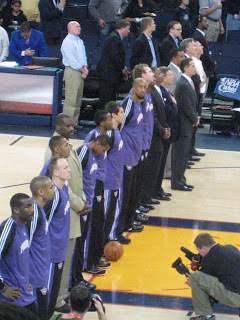 Phoenix Suns during the National Anthem. Thursday..I went to my core strength class and it kicked my @ss. Friday..I put in 3000+ yards at the pool. Saturday..Hez and I had an awesome run that started at the Marina Green...across the Golden Gate Bridge..into Sausalito and back. That was such a great run and I've never walked or ran across the bridge in all the years that I've lived in SF! Highlight of the run aside from the run itself, passing a girl that was riding her bike up a long but slight incline of a hill! I giggled and said to Hez, "We passed someone on their bike.. running! " Sunday..um..let's see...I didn't go out on Sat. night because I had to be in Danville at 7am for a double brick workout! Sorry Annie to have missed your b-day party. I had one heck of a training morning..as I was driving to Danville..my front tire that was in my car started to deflate..great..I have a flat! At least it wasn't while I was riding! Then as we were warming up on our trainers...apparently my bike wasn't secured into the trainer so I got launched from it! Ok..launch might be exaggerating a little but it does make for a better story! What would have made for a great story is if I had taken out my row of teammates! Now, that would have been awesome! Haha. I didn't think that I got any boo boos from it until I continued to warm up and saw signs of red...for a couple of band aides from Coach Alex and I was good to go. Our double brick workout consisted of a 20 mile bike and a 30 minute run..then repeat! Hez and I hauled @ss on the second 20 miler and was able to improve our time by 4 minutes but the second run was pretty painful because of my now heavily swollen knee. Hez kept telling me to slow down because I was shuffling so fast while thinking "ouch"..."ouch"..."ouch"...in my head. After the workout, I headed to Ted and Mai's place for a great mentor group brunch but not before stopping by home for a quick shower and cleaning of the wound. Brunch..cinnamon buns of all sorts...eggs..fruit..yumminess! A great weekend of workouts! My left knee is now double the size of my right knee but I am okay and hey..I still did and finished my workout...I think that deserves some "tough cookie" points :)! you did a 20 mile bike (twice) on trainers? dear god, that's just plain wrong, especially on a gorgeous day like today. I hope your knee deflates quickly. hi lorri..no, we warmed up on the trainer but went out on the road for the actual ride!